There’s an annoying little advertisement for the post of social care inspector at Ofsted that keeps popping up on my screen, when I’m trying to read something else. 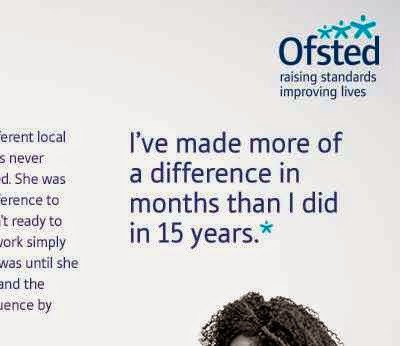 Somebody who left a front line job in local authority social work to join Ofsted is quoted in the ad as saying that she has "made more difference "in a few months at Ofsted than she did in fifteen years of practice. This conveys completely the wrong message: (1) it puts practice down, when what is most important is the right service at the point of delivery, not at the point of inspection; (2) it undervalues the work of practitioners and overvalues the work of inspectors; (3) it suggests that top-down is the route to improvement – Ofsted knows best – when what is needed is continuous improvement by those that practice, not endless prescription by those that can only preach.